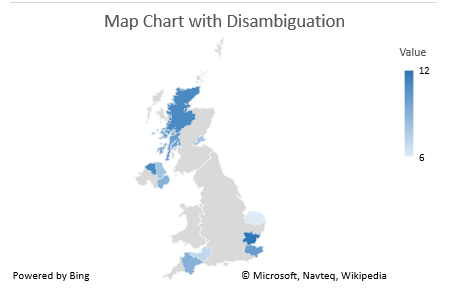 You can use a Map Chart to compare values and show categories across geographical regions. 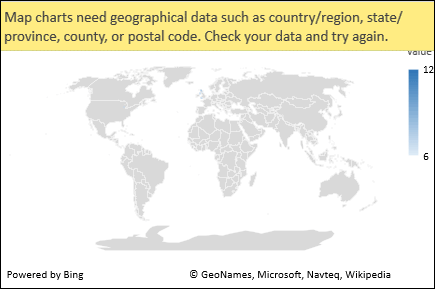 Use it when you have geographical regions in your data, like countries/regions, states, counties or postal codes. You can download a workbook with several Map chart examples like the ones in this article. Maps can display both values and categories, and they each have different ways of displaying color. Values are represented by slight variations of two to three colors. Categories are represented by different colors. For example, Countries by Population uses values. The values represent the total population in each country, with each portrayed using a gradient spectrum of two colors. The color for each region is dictated by where along the spectrum its value falls with respect to the others. 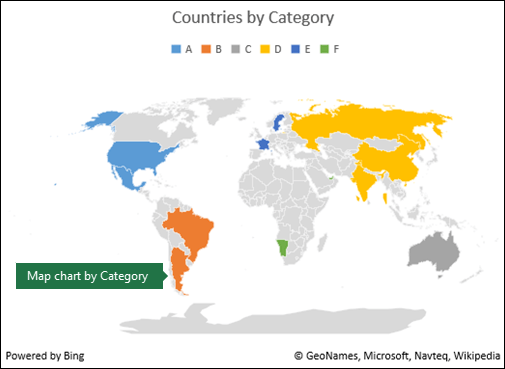 In the following example, Countries by Category, the categories are displayed using a standard legend to show groups or affiliations. Each data point is represented by an entirely different color. You can copy the following data that we used for our examples, or set up your own in a similar fashion. 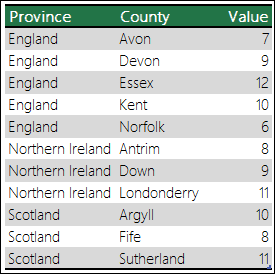 Start with one column for your geographic location (country/region, state or province, county or postal code), then your numeric or categorical values in the second column. In some cases, you might need to add another level of geographic detail (see Frequently Asked Questions). Select any cell within the data range. Tip: If you haven't already, now would be a good time to set up your data as an Excel Table. It not only formats the data and adds filters for you, but it also makes it easier to create PivotTables to analyze it. Click Insert > Charts > Recommended Charts, or Insert > Charts > Maps, then select the map chart. Depending on your data, Excel will preview either a value or category map. Once you press OK, Excel will insert your map. Once your map has been created you can easily adjust its design. Just click on the Map, then choose from the Design or Format tabs in the Chart Tools ribbon tab. You can also Right-Click on the chart and select from the menu options there, or double-click the chart to launch the Format Object Task Pane, which will appear on the right-hand side of the Excel window. 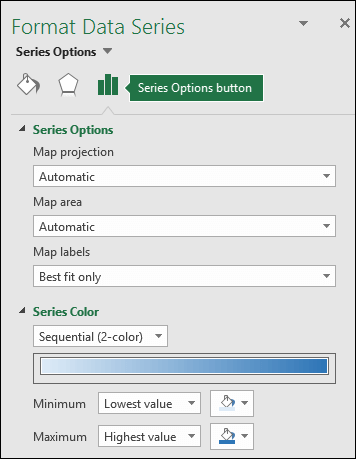 This will also expose the Map chart specific Series options (see below). See more on formatting charts. There are several Map chart specific Series options, however they are not supported in Android devices or Excel Mobile. 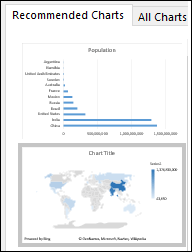 If you need some of the Map Series options, then you can build your chart in Excel for Windows and view it on an Android device or Excel Mobile. 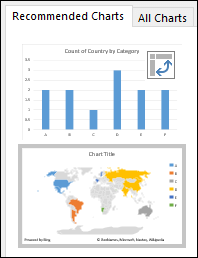 Learn more about Formatting Map Charts. Map Area - Change the map's Zoom level, ranging from a state/province view, all the way to the world view. Map Labels - Show geographic names for your countries/regions. Chose to show names based on fit, or show all labels. Question: When I use certain locations, I end up with a blank map and an error, or some of my points map in other countries. Answer: If you use data where there might be more than one similar location in the world, Maps can’t necessarily tell the difference without more guidance. If possible, add another column to your data to help Maps know where to look. For example, this data won’t necessarily map the way you expect since there are many places in the world where these are valid county names. Map charts can only plot high-level geographic details, so cities, latitude and longitudes, and street address mapping isn’t supported. Map charts also support one-dimensional display only, but if you need multi-dimensional detail you can use Excel’s 3D Map feature. Creating new maps, or appending data to existing maps requires an online connection (to connect to the Bing Map service). Existing maps can be viewed without an online connection. There is a known issue where Map Charts which make use of Geography Data Types can sometimes map incorrectly. Please try to include Admin Fields, such as Country when attempting to plot these until the problem is fixed. 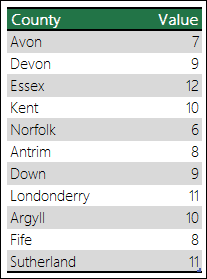 You can copy the following data that we used for our examples, or set up your own in a similar fashion. On the ribbon, click the Insert > Recommended Charts > Filled Map. 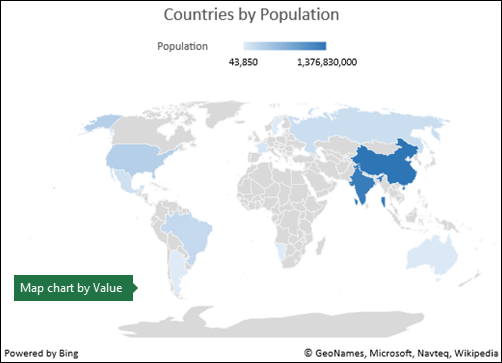 There are two Filled Map options available- one is the value map (depicts countries shaded in blue) and the other is the category map (depicts countries shaded in color). You can select either option based on your preference. Note: The Filled Map options will appear under Recommended Charts only if the data is relevant. Tip: In Excel for Mac, use the Chart Design and Format tabs to customize the look of your chart. If you don't see these tabs, click anywhere in the map chart and the tabs will appear on the ribbon.